I recently placed an online order on the Lancome website when I saw this amazing palette. It is designed by Lisa Eldridge! YES....THE FREAKIN AMAZING, I LOVE TO WATCH HER VIDEOS, MAKEUP ARTIST TO THE STARS, AN AMAZING INSPIRATION...THE Lisa Eldridge. This woman knows makeup and she is an artist! OMG, that alone makes this a "MUST HAVE" palette. Okay, okay...I know, enough singing her praises! This gorgeous palette features sixteen shades (I'll list them all below) and a dual-ended eyeshadow brush. I ordered mine from the Lancome website and it should arrive within the next few days. So check back for swatches!!! I'm super excited, super pumped to try it. On the Lancome website they have a few video tutorials showing different looks you can create with the palette. Plus there are different makeup looks listed for inspiration too. 16 SHADES. 1 PALETTE. INFINITE POSSIBILITIES. "How Audacious are you today? 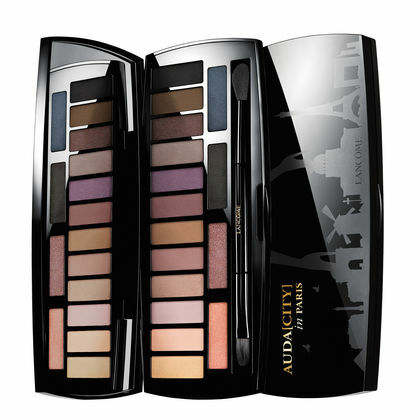 Designed by Lisa Eldridge and inspired by the streets of Paris, Lancôme's first multi-palette has 16 beautiful shades in 4 finishes that let you bring Paris wherever you go. Pick a chic look for the day, an audacious look for the night, or anything that falls in between." I agree with you Beth! Lisa really knows her stuff and she is super fun to watch. OMG! Love her accent too!